This weeks article looks at the cultivation of the witness self in meditation, and why we should be interested in it! Cultivating the experience of the witness self means to cultivate your experience of self as a detached observer of your mind, body and life experiences, as opposed to having your sense of self totally caught up in them. The path to personal liberation from pain and suffering has an enormous amount to do with the cultivation of the witness self. To the extent that we are able to detach ourself from our pain we can control it. If we can detach ourself from our pleasure we can enjoy it without clinging to it and thus avoid the experience of pain that happens when we are separated from that pleasure. As a fifteen year old at school I had a friend the same age (let’s call him Tony) who went out with a seventeen year old girl. She left him for an older boy who was a mutual friend. Tony subsequently told me the story of how he had confronted the older boy and shouted and screamed at him in an emotional outburst. He then told me, looking slightly sheepish about how he had felt that there was a part of him watching the whole episode (including himself screaming and shouting) that was not upset at all, but felt detached and calm. That “watcher” that he had experienced amidst his emotional outburst was his witness self. Later I had a female friend at collage who similarly discovered that her boyfriend had been having an affair with another woman whilst away at University. Again with a similar sense of sheepish confusion she described to me how she had shouted and screamed at her boyfriend whilst simultaneously feeling that a part of her was observing the situation with total calm and detachment. Like my friend Tony, my female friend had found herself aware of her witness self at the same time as she experienced emotional turmoil. So, with meditation we cultivate awareness of this witness self, making it increasingly “front and center” of our daily experience, and consequently finding an increasing sense of ever present calm even when under multiple forms of stress. Consequently we find ourself basically “always ok”, nothing we can’t handle. Reading this some people may think that cultivating the witness self may make us cold, uncaring, emotionally mono-syllabic and so on. The reality is however that when practised in an integrated and balanced way, centring our awareness in the witness self increases our capacity to enjoy deeper and more positively multiple forms of emotion, pleasure, happiness and wellbeing. You could say that it liberates us to a whole new level of the human experience. A final point; being centred in the witness self also liberates us substantially from the fear of making mistakes, looking foolish, taking an appropriate chance. So, whilst finding an experience of liberation through the detachment of the witness self, we concurrently find a new way of engaging in our world and human experience more freely and dynamically. 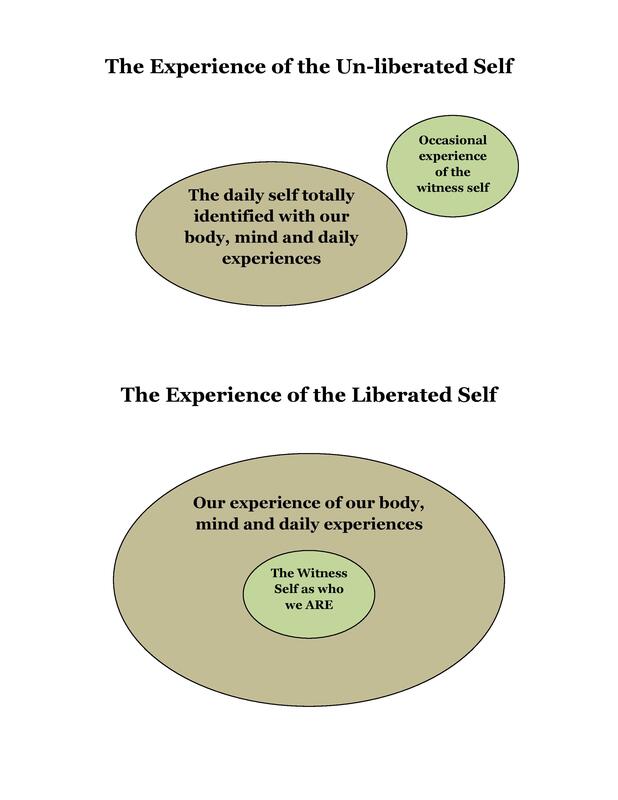 I’ve created a diagram below that illustrates in a very simple way the essential transformation that comes from cultivating our identity as the witness self. I hope the image helps to give a feeling for what I have written about above! Categorized under: Integral Awareness, Integral Meditation, Meditating on the Self, Mindfulness, Presence and being present, spiritual intelligence, Uncategorized. Tagged with: awareness, consciousness, enlightenment, inner growth, inner peace, inner vision, insight, integral meditation, integral meditation asia, meditation, meditation in singapore, mindful of self, power of mind, present moment, stress relief, The True Self, the witness self.